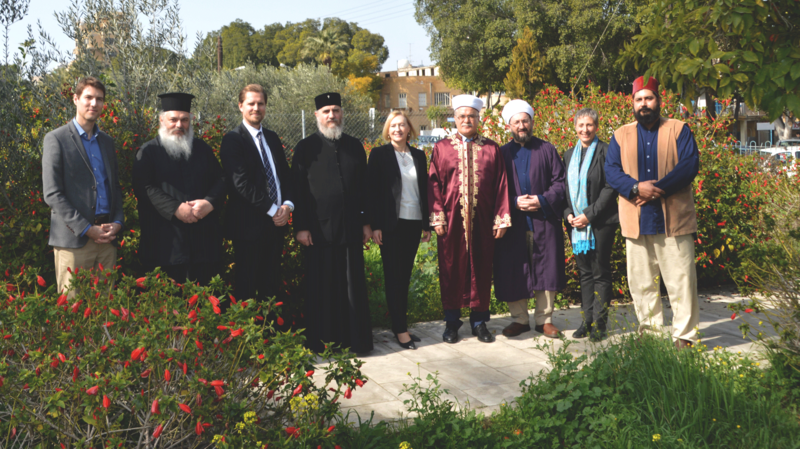 On 7 February 2018, the United Nations Special Representative of the Secretary General (SRSG) and Head of UNFICYP, Ms. Elizabeth Spehar, visited a selected number of religious monuments and cemeteries high on the agenda of the religious leaders of Cyprus. Archbishop Chrysostomos II of the Greek Orthodox Church of Cyprus and Dr. Talip Atalay, Mufti of Cyprus welcomed the visit and the support of UNFICYP. Bishop Porfyrios of Neapolis and Imam Shakir Alemdar of Hala Sultan Tekke briefed the SRSG about the state of the religious monuments visited, and about some of the challenges the faith communities face in regards to accessing and restoring these sites of worship. 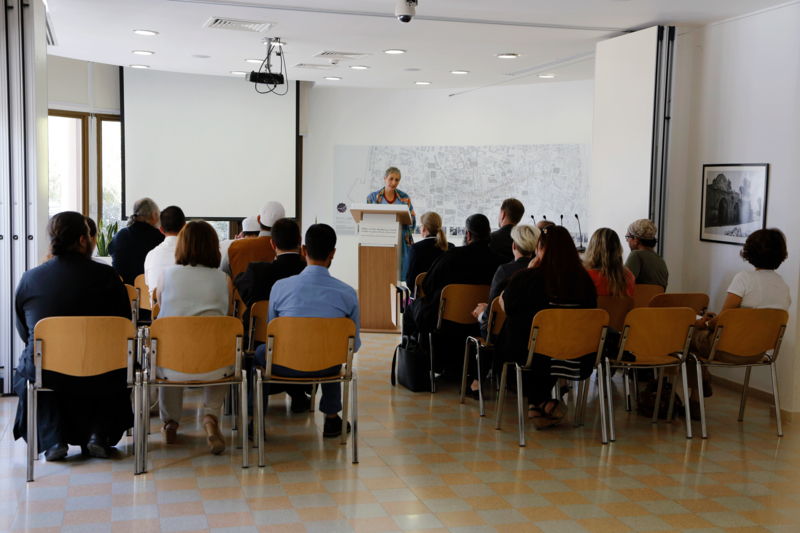 SRSG Spehar thanked the Office of the Religious Track of the Cyprus Peace Process (RTCYPP) for organizing the visit and took the opportunity to express her support for the joint advocacy efforts of the religious leaders of Cyprus for religious freedom, coexistence, peace and reconciliation. 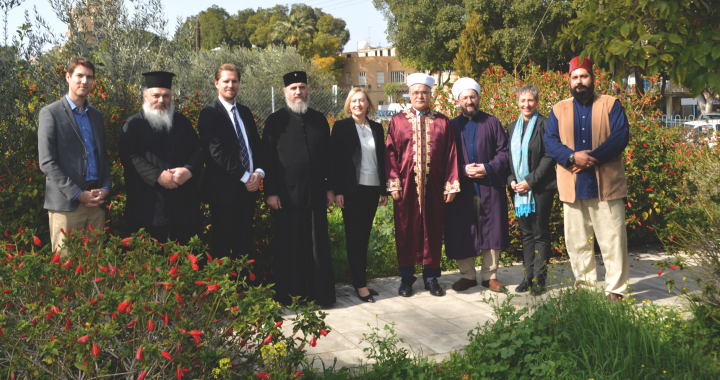 The visit took place on the last day of World Interfaith Harmony Week, proclaimed by the United Nations General Assembly to acknowledge that mutual understanding and interreligious dialogue constitute important dimensions of a culture of peace. 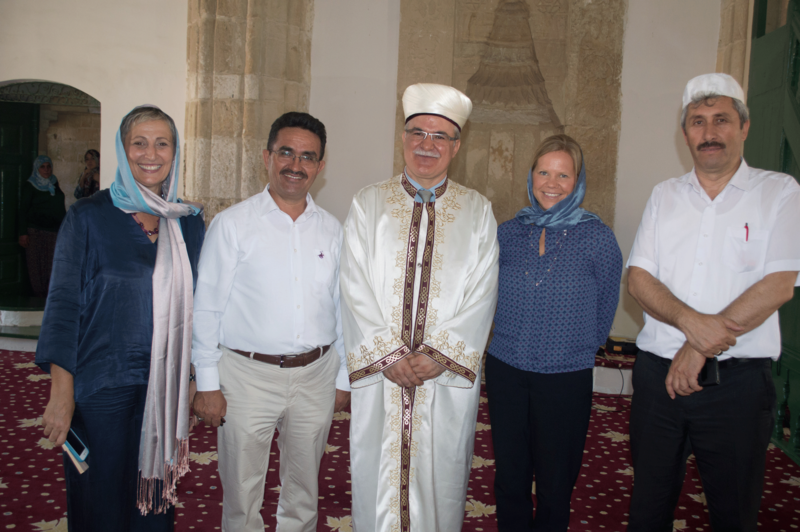 The joint field visit to religious monuments are a positive example of how the religious leaders of Cyprus, within the framework of RTCYPP, are working together in solidarity to advocate for religious freedom and the protection of all religious monuments in Cyprus. Deputy Head of Mission of the Embassy of Sweden, Mr. Peter Kvist and RTCYPP Executive Coordinator Ms. Salpy Eskidjian accompanied the visit. The RTCYPP is an unprecedented local confidence and peacebuilding effort, initiated in 2009 under the auspices of the Embassy of Sweden. In his latest 6-month report, the Secretary General of the United Nations, Mr. António Guterres, acknowledges the recent steps taken by the religious leaders of Cyprus to build confidence between the communities on the island and recommends that all restrictions on the freedom of worship, including those relating to access to religious sites, should be lifted. The Secretary General expresses his appreciation for the commitment of the religious leaders of Cyprus to joint dialogue and the promotion of religious freedom supported by the Office of the Religious Track of the Cyprus Peace Process under the auspices of the Embassy of Sweden (RTCYPP). Referring to the RTCYPP, Mr. António Guterres emphasizes the unprecedented joint initiative by the religious leaders to approve “Greek and Turkish language classes for members of the clerical orders, nuns and laypersons working in different religious institutions.” The Secretary General also acknowledges the third RTCYPP Round Table for Human Rights, organized in cooperation with UN Office of the High Commissioner for Human Rights (OHCHR), for its efforts in bringing together representatives from 16 religious groups and civil society organizations in Cyprus to discuss human rights. The Secretary General also recognized the significance of religious services and pilgrimages as constituting a significant confidence-building measure. In that light he underlined the special pilgrimages to Hala Sultan Tekke, which is one of the achievements of the RTCYPP, where with the cooperation of UNFICYP, the Mufti of Cyprus and the full support of Archbishop of the Church of Cyprus a total of 2270 Muslim pilgrims of Turkish origin were able to pray in Hala Sultan Tekke during the reporting period. The report to the Security Council mentions that UNFICYP has noted with concern the decline in the number of applications for religious services that it was asked to facilitate in the north, and a decline in numbers of approvals for such services, in comparison to the same period in 2016. The Secretary General states that the UN Mission in Cyprus remains also concerned about other restrictions that hampered religious worship on the island, including time limitations on religious worship in mosques in the south. The 6-month report of the Secretary General (Reference: S/2018/25) on the operation in Cyprus was presented to members of the UN Security Council on 17 January when the renewal of UNFICYP’s mandate for an additional six more months was discussed. 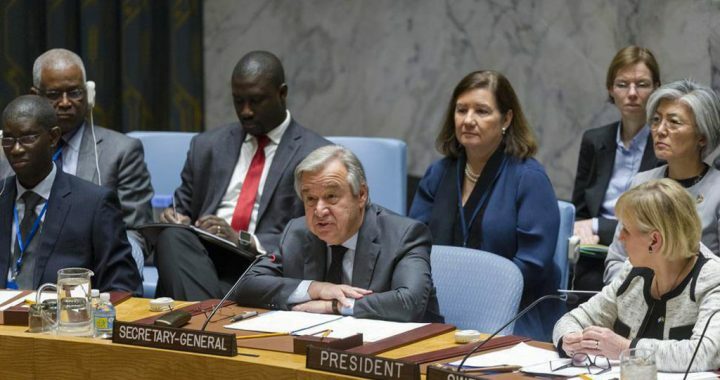 Reports of the Secretary-General on the United Nations Operation in Cyprus are made twice a year and cover UNFICYPs operations and the political developments on the island. Full extract of the UN Secretary General references to the RTCYPP is found here below. Paragraph 24. Opportunities to visit and hold services at religious sites continue to be important to both communities. During the reporting period, UNFICYP facilitated the participation of more than 5,375 people in 34 religious and commemorative activities either in the buffer zone, or at the required crossings to the other side, of which 27 were in the north and seven in the buffer zone. During the same period in 2016, a total of 36 services and commemorative events were held (29 were in the north, 7 in the buffer zone). 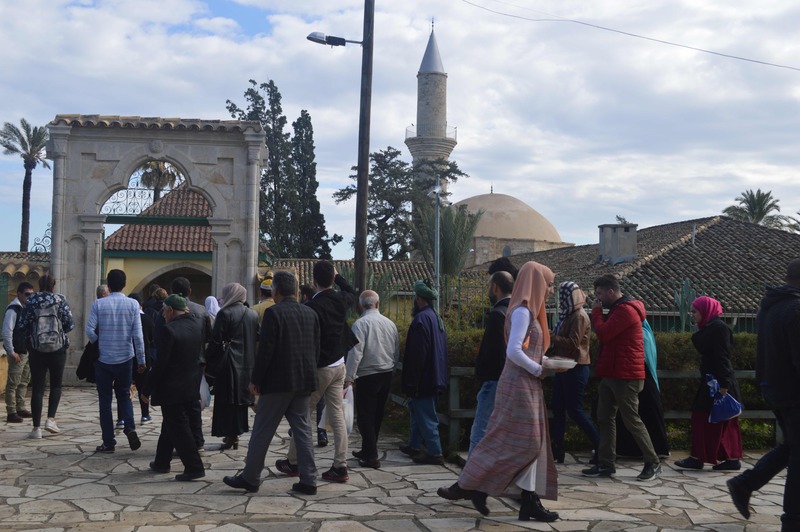 Separately, UNFICYP facilitated crossings of nearly 2,270 pilgrims from the northern part of Cyprus to the Hala Sultan Tekke mosque in Larnaca on 26 June, 5 September and 29 November respectively. The pilgrimage on 29 November was the eleventh following the joint agreement of the religious leaders in 2014. Paragraph 25. Given that such events constitute a significant confidence-building measure, UNFICYP noted with concern the decline in the number of applications for religious services that it was asked to facilitate in the north, and a decline in numbers of approvals for such services, in comparison to the same period in 2016. The Mission remained concerned about other restrictions that hampered religious worship on the island, including time limitations on religious worship in mosques in the south. All restrictions on the freedom of worship, including those relating to access to religious sites, should be lifted. Paragraph 26. 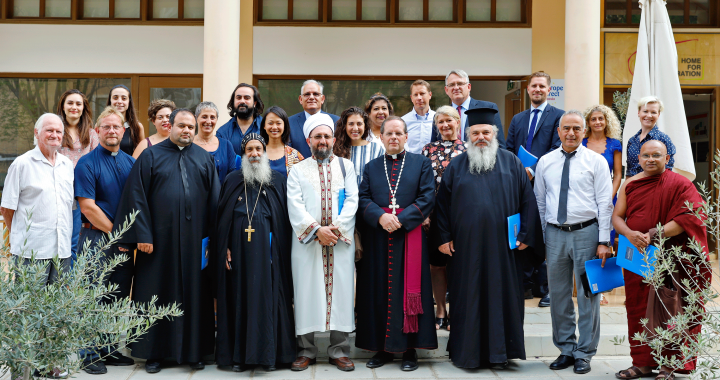 The religious leaders of Cyprus sustained their commitment to joint dialogue and the promotion of religious freedom within the framework of the Religious Track of the Cyprus Peace Process under the auspices of the Embassy of Sweden, with ongoing support from UNFICYP. During the reporting period, the religious leaders undertook an unprecedented joint initiative by approving Greek and Turkish language classes for members of the clerical orders, nuns and laypersons working in different religious institutions. The participants meet each other weekly in the buffer zone, broadening the circle of dialogue and cooperation between these religious institutions. Paragraph 27. 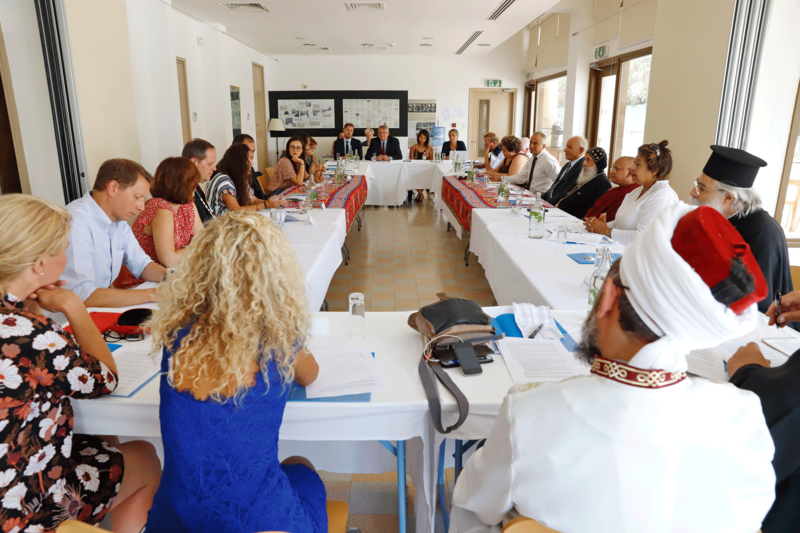 In cooperation with the UN Office of the High Commissioner for Human Rights (OHCHR), on 28 September the Office of the Religious Track of the Cyprus Peace Process convened the third round table on human rights since 2013. OHCHR introduced Faith For Rights, an initiative launched in March 2017 via the Beirut Declaration, in which faith-based civil society actors recognized “religious or belief convictions as a source for the protection of the whole spectrum of inalienable human entitlements”. 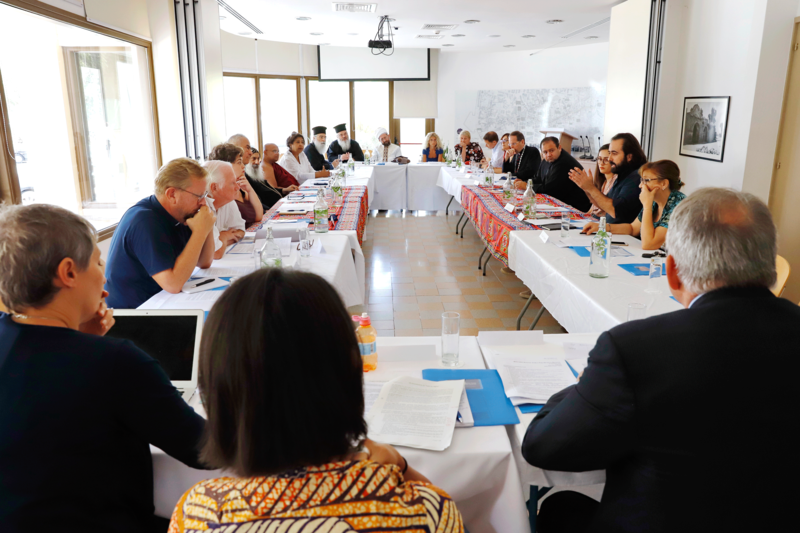 Religious leaders and representatives from 16 religious groups and civil society organizations joined the discussion in Cyprus, and the Beirut Declaration and its 18 Commitments were translated into Greek and Turkish by the Religious Track of the Cyprus Peace Process. 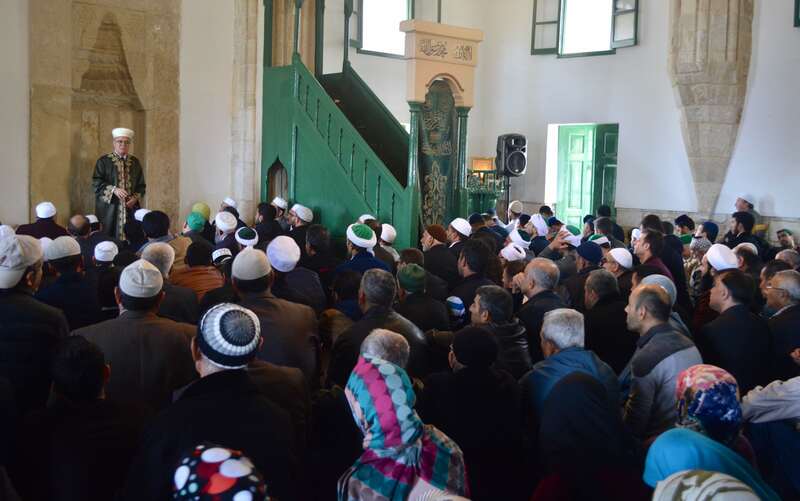 On the occasion of the Mawlid-al Nabi - a special pilgrimage to Hala Sultan Tekke took place today, on the 29th of November. 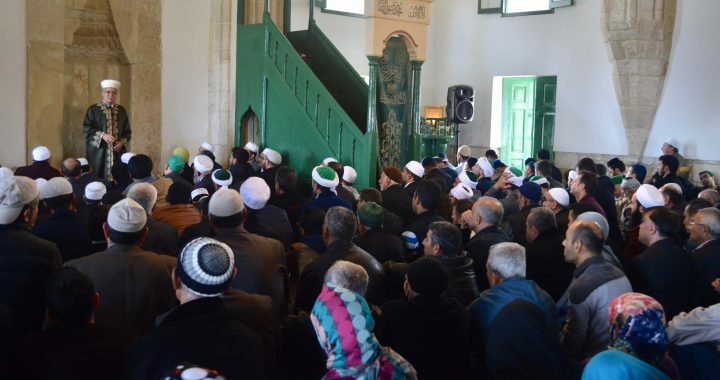 Mufti of Cyprus, H.E Dr Talip Atalay led prayers at noon for 950 faithful of Turkish origin that cannot otherwise cross the buffer zone in the divided island of Cyprus. Mawlid al-Nabi, or Mevlid Kandili in Turkish, is the observance and celebration of the birth of Prophet Muhammad. Mawlid is celebrated on the 12th day of the third month of the Islamic calendar, called Rabi’al-Awwal. Mawlid begins in the evening of 29 November and ends in the evening of 30 November 2017. 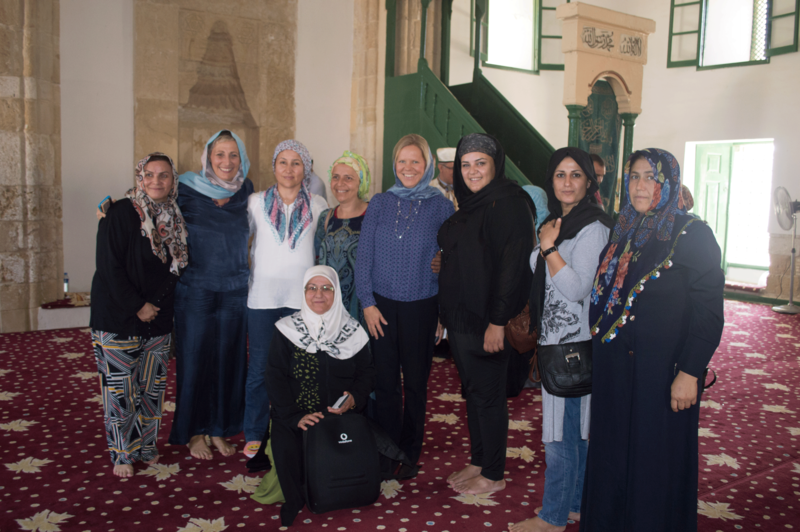 The special pilgrimage was organised and led by the Mufti of Cyprus, coordinated by the Office of the Religious Track of the Cyprus Peace Process (RTCYPP) and facilitated by UNFICYP and UN Police. This was the 11th pilgrimage since 2014, and the third in 2017 arranged within the framework agreement of the RTCYPP. To this date 9500 pilgrims have been able to cross and pray at Hala Sultan Tekke through this special arrangement. 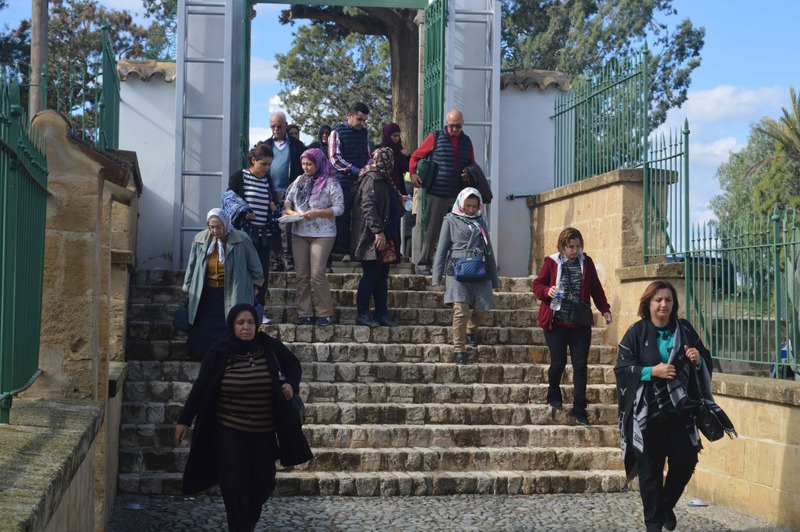 “We are thankful that through our joint efforts as religious leaders of Cyprus, with the support of the Office of RTCYPP under the Auspices of the Embassy of Sweden, we were able to have this special pilgrimage to Hala Sultan Tekke. Once again our hearts are filled with hope. Today’s pilgrimage is a testament to the commitment of the religious leaders of Cyprus to continue working together for religious freedom, human rights and reconciliation. We are grateful to all those who support our efforts.” said Mufti Talip Atalay. H.E. Ambassador of Sweden, Anna Olsson Vrang and Rev. 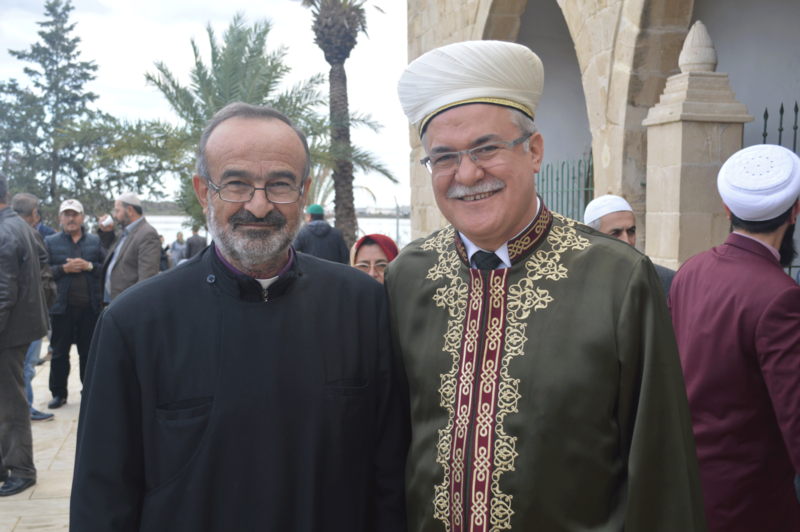 Father Mashdotz Ashkarian, representing Archbishop Khoren of the Armenian Orthodox Church of Cyprus, were on site at Hala Sultan Tekke and extended their best wishes for Mawlid-al Nabi to Mufti Talip Atalay and to all Muslims living in Cyprus. “I’m grateful to the Cyprus religious leaders’, UNFICYP and UN Police for their efforts and cooperation to enable today’s special pilgrimage.” said Ambassador Olsson Vrang. A High-Level meeting of the Religious Track of the Cyprus Peace Process (RTCYPP) took place on 16 November 2017, coinciding with the 22nd Anniversary of the International Day of Tolerance. The meeting was hosted by the Ambassador of Sweden to Cyprus, H.E Anna Olsson Vrang, at her residence in Nicosia. Present at the meeting were H.B Archbishop Chrysostomos II of the Church of Cyprus, H.E Talip Atalay, Mufti of Cyprus, H.E Archbishop Khoren Doghramadjian of the Armenian Orthodox Church of Cyprus, Rev Jerzy Kraj, Latin Patriarchal Vicar and of the Apostolic Nunciature in Cyprus and Father Ibrahim Khita, representative of H.E Archbishop Soueif of the Maronite Church of Cyprus. 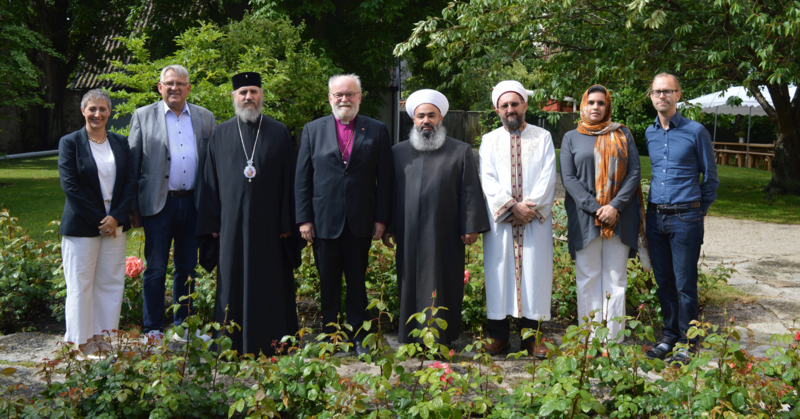 “Today’s meeting of religious leaders coincides with the International Day for Tolerance. The leaders’ commitment to work together for human rights, peace and reconciliation is nothing less than a testament to the spirit of this particular day, namely the universal values of mutual respect and tolerance. I am impressed by their courage and leadership in this regard and hope it can be an inspiration to others”, said Ambassador Olsson Vrang. The religious leaders discussed recent developments related to the religious heritage of Cyprus and religious freedom in Cyprus, as well as their joint plans for the rest of the year. They reiterated their request for the political leadership to continue to intervene so that all places of worship and religious heritage in Cyprus are respected, permission is granted for their restoration and the right to worship is respected. 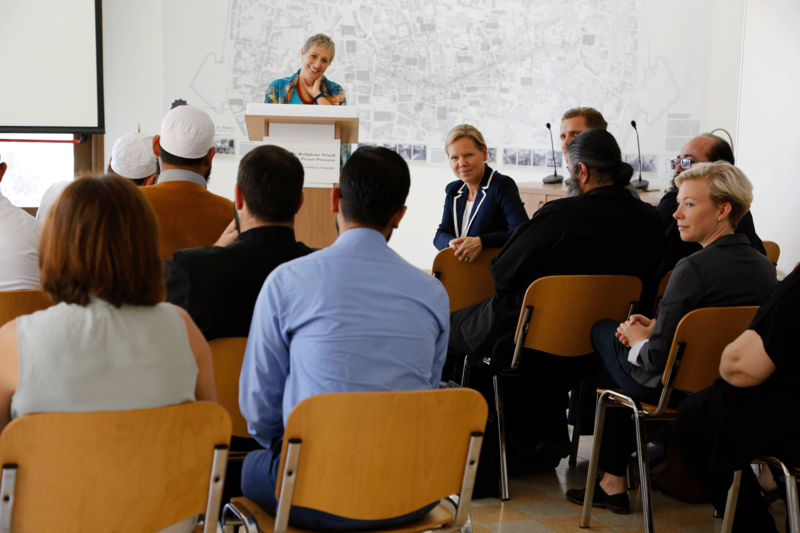 Prior to their meeting, the religious leaders jointly visited the Green Line together with UN SRSG Elizabeth Spehar, Head of UNFICYP and Ambassador Olsson Vrang. They welcomed the visit and reiterated their appreciation for the UN SRSG’s interest in and support for their joint peacebuilding efforts. The visit provided an opportunity for them to see the historic churches of St Jacob and St George, among others. The religious leaders expressed their dismay with the tragic state of the two churches and the lack of urgent action for their reinforcement despite their joint efforts under the auspices of the Embassy of Sweden. A new joint project of the religious leaders of Cyprus to provide an opportunity for members of the clerical order and laypersons to meet each other and learn Greek and Turkish for the very first time in Cyprus is being launched on 5 October 2017 by the Office of RTCYPP at the Home for Cooperation in the Buffer Zone in Nicosia. The Greek and Turkish classes will take place simultaneously on a weekly basis followed by a joint time, hosted and facilitated by the Office of RTCYPP, where the participants will get the chance to know each other and practice what they learn. 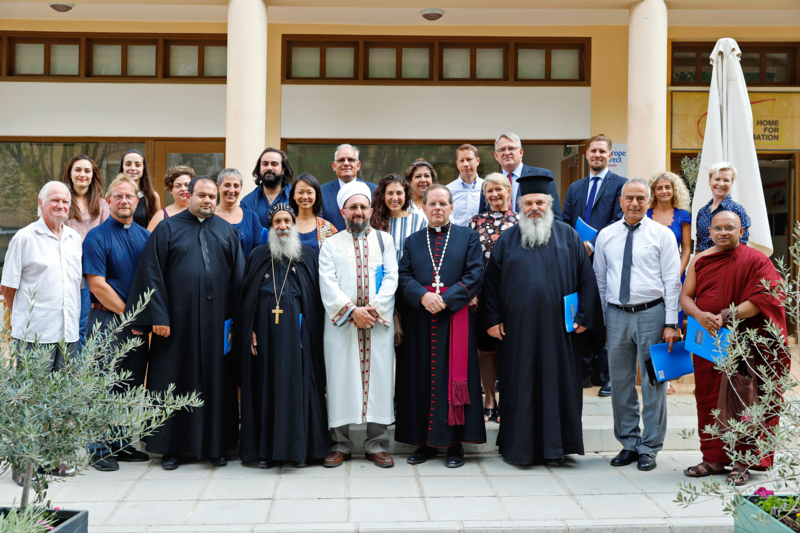 The pilot project is initiated, organized and funded by the Office of RTCYPP following the full support and endorsement of the religious leaders of Cyprus. Ambassador Olsson Vrang will be opening the Language Course and welcome the participants. 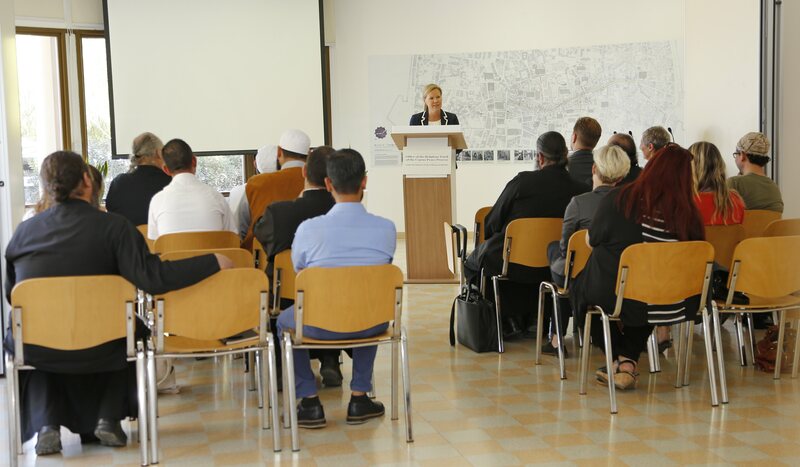 Office of RTCYPP initiates and supports joint initiatives such as this, aimed at encouraging the positive joint contributions of all the religious leaders of Cyprus to confidence and peace building. The Office of RTCYPP will be convening its third Round Table for Human Rights with representatives of faith communities and partner civil society organisations on the 28 September 2017 at the Home for Cooperation. The main aim of the meeting will be to provide an opportunity for the United Nations Office of the High Commissioner for Human Rights (OHCHR) to introduce its initiative “Faith for Rights” including the “Beirut Declaration” and its 18 Commitments as a follow up of the 2012 “Rabat Plan of Action” to the faith communities in Cyprus. 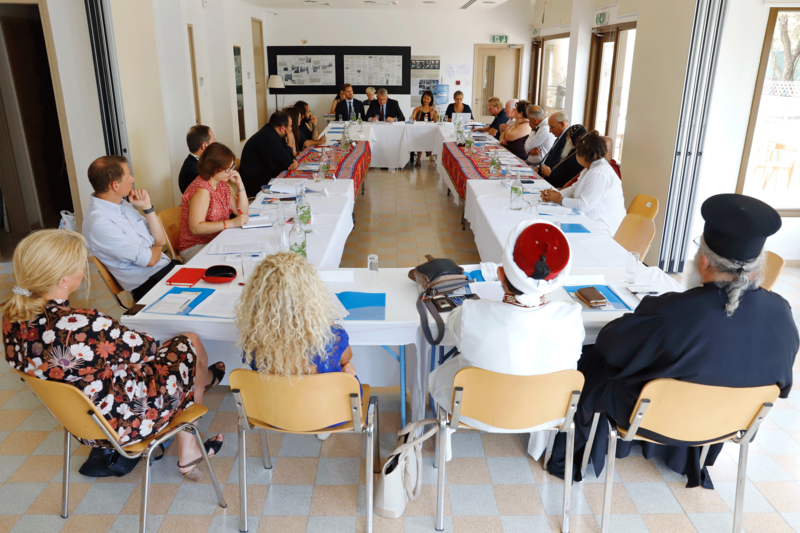 The Office of RTCYPP convened the first Round Table for Human Rights in 2013, in cooperation with the OHCHR and the Special Rapporteur on Freedom of Religion and Belief (FORB). 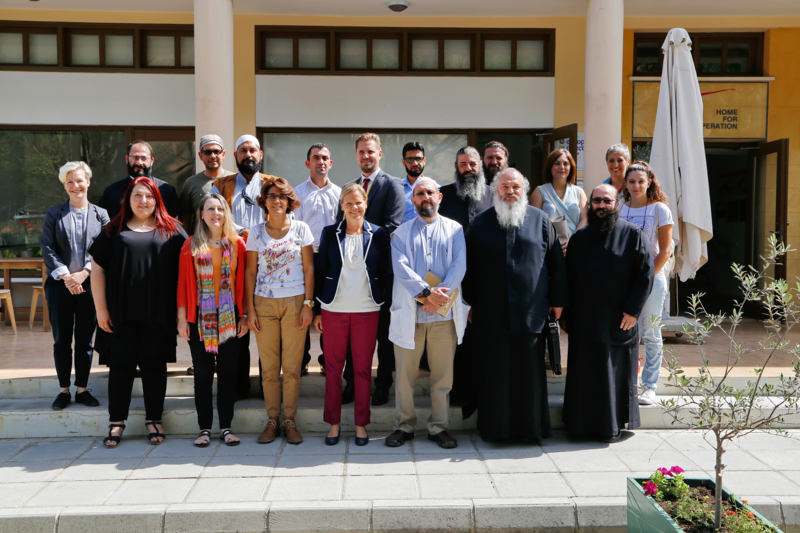 For the first time faith communities in Cyprus came together with civil society partners from both sides of the divided island to address and discuss together issues related to freedom of religion or belief. 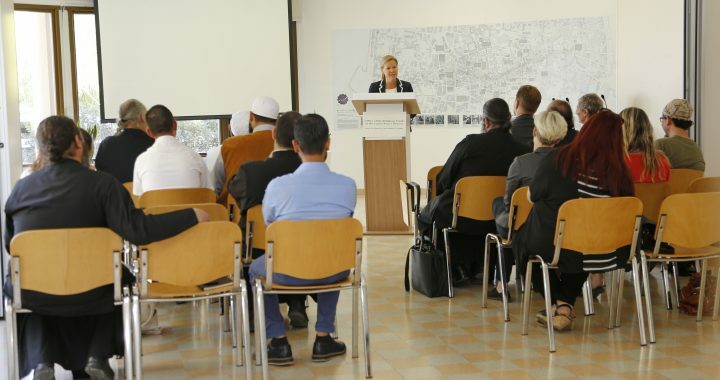 The second Round Table for Human Rights took place in October 2015 once again in cooperation with the Office of OHCHR and the Special Rapporteur on FORB focussing on the right to access and restore sacred places and education as a tool to promote freedom of religion. The 2017 RTCYPP Round Table for Human Rights will discuss concrete ways to engage with “Faith for Rights" to be implemented for and with women, men and children on the whole island. 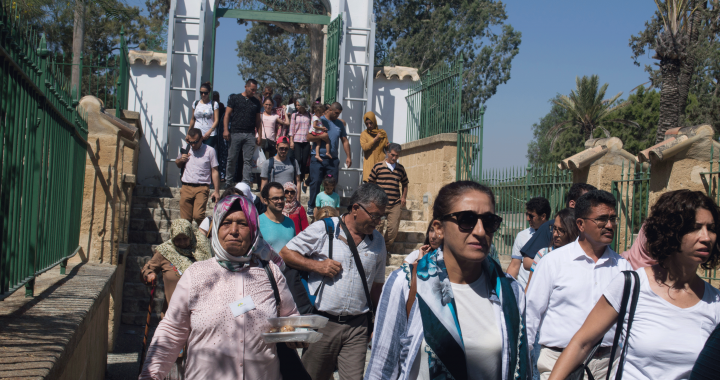 On the occasion of the Eid al-Adha - Kurban Bayram - a special pilgrimage to Hala Sultan Tekke is taking place today, on the 5th of September, for 600 faithful of Turkish origin that cannot otherwise cross the buffer zone in the divided island of Cyprus. H.E. 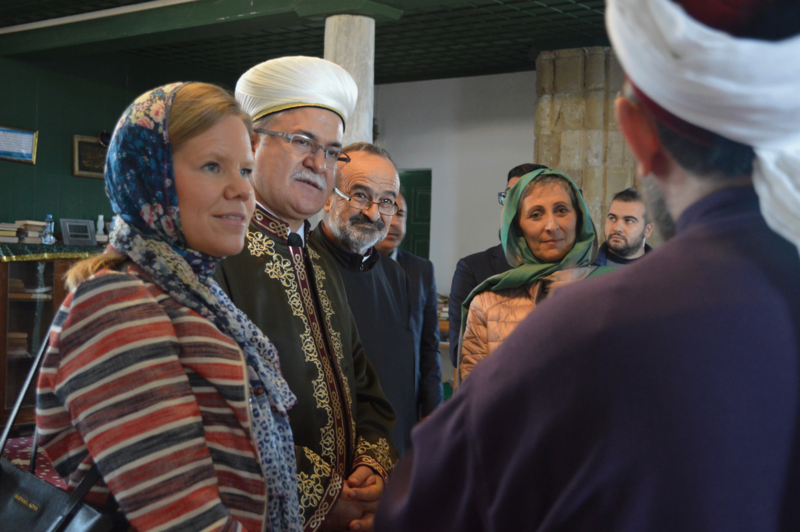 Ambassador of Sweden, Anna Olsson Vrang, was on site at Hala Sultan Tekke for the first time at a special pilgrimage and extended her best wishes for the Eid to Mufti Talip Atalay and to all Muslims living in Cyprus. 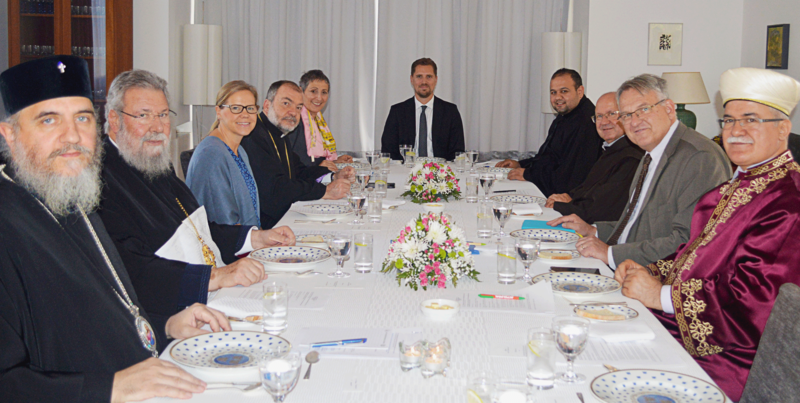 “I’m happy that Sweden through the initiative of the Religious Track of the Cyprus Peace Process can contribute to the promotion of freedom of religion and the respect of basic human rights principles on this beautiful island”. The special pilgrimage to Hala Sultan Tekke is the result of an unprecedented agreement between the religious leaders of Cyprus, namely H.B. Archbishop Chrysostomos II of the Church of Cyprus and the Mufti of Cyprus H.E. Dr Talip Atalay. The agreement was reached in 2014 within the framework of the Religious Track of the Cyprus Peace Process under the Auspices of the Embassy of Sweden (RTCYPP) and has had the full support of the Foreign Minister of the Republic of Cyprus, H.E. Mr Kasoulides. 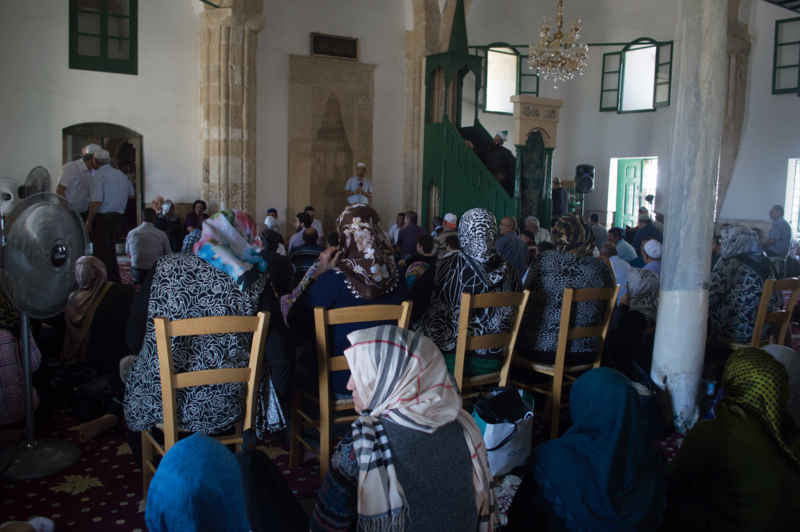 The special pilgrimages are organised and led by the Mufti of Cyprus, coordinated by the Office of RTCYPP and the facilitated by UNFICYP and UN Police. 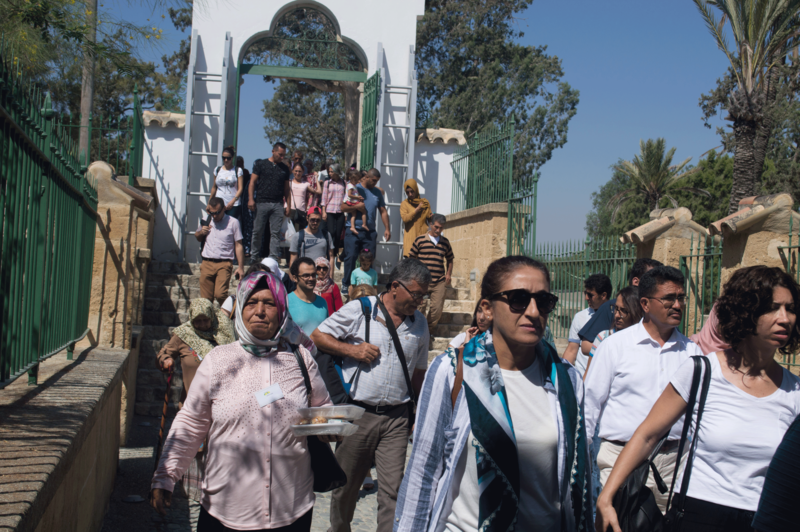 Special pilgrimages to Hala Sultan Tekke have been taking place three times annually as per the request of the Mufti of Cyprus on the occasions of Eid al-Fitr, Eid al-Adha and Mawlid-al Nabi. This was the 10th pilgrimage within this framework agreement since 2014. Kurban Bayram or Eid al-Adha, is one of Islam's holiest festival celebrated annually around the world and an official holiday in Muslim-majority countries. It marks the end of the Hajj to Mecca. In Cyprus it is known as Kurban Bayram. For Muslims, Eid al-Adha commemorates the day when prophet Abraham or Ibrahim was going to sacrifice his son but was instructed by God to offer an animal instead. Eid al-Adha in Arabic literally means "festival of the sacrifice". One essential part of this holiday is to distribute meat amongst the needy. Families who can't provide meat may choose to make contributions to charities that will provide meat to those who are in need. The feast is welcomed with the greetings “Kurban Bayramınız Kutlu Olsun” or “Eid Mubarak”. In 2017, Eid al-Adha begins in the evening of August 31 and ends in the evening of September 4. The Mosque of Umm Haram at Hala Sultan Tekke is considered the most significant Muslim place of worship in Cyprus. The Tekke is open daily at set hours by the Antiquities Department and used by Turkish Cypriot and other Muslim faithful freely. The Imam of Hala Sultan leads prayers every Friday. As a result of the religious leaders’ dialogue known as RTCYPP, the Archbishop of the Church of Cyprus and former Ministers of Interior of the Republic of Cyprus supported the Mufti’s request to set up an office for the Imam. Recently cooking and guest facilities have also been added to serve pilgrims on Fridays and feast days. During Ramadan and other special feasts special arrangements are made for Hala Sultan Tekke to be open longer hours day and night to accommodate the worshipping needs of the faithful. 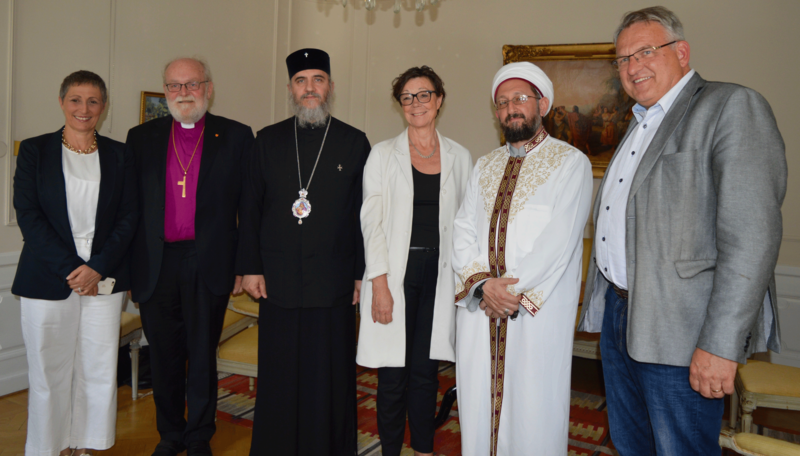 Representatives of the religious leaders of Cyprus met with the State Secretary for Foreign Affairs of Sweden, Annika Söder, during the annual political week of Sweden, known as, Almedalen, in Visby. The State Secretary thanked the religious leaders of Cyprus for their continued dialogue to restore trust, contribute to the peace process and the ongoing efforts to reunify the country. The Archbishopric of the Church of Cyprus, was represented by Bishop Porfyrios of Neapolis, the head of the Church’s representation to the European Institutions, and the Muftiate of Cyprus by Imam Shakir Alemdar of Hala Sultan Tekke. At the invitation of the Bishop of Visby, Sven Bernard Fast and the Director of the Swedish Institute in Alexandria, Peter Weiderud, the representatives of the religious leaders together with the Executive Coordinator of the Office of RTCYPP, contributed to a seminar on the role of religion in conflict and peacebuilding highlighting the case of Cyprus. The well-attended seminar also involved representatives from other conflict countries in the MENA Region. 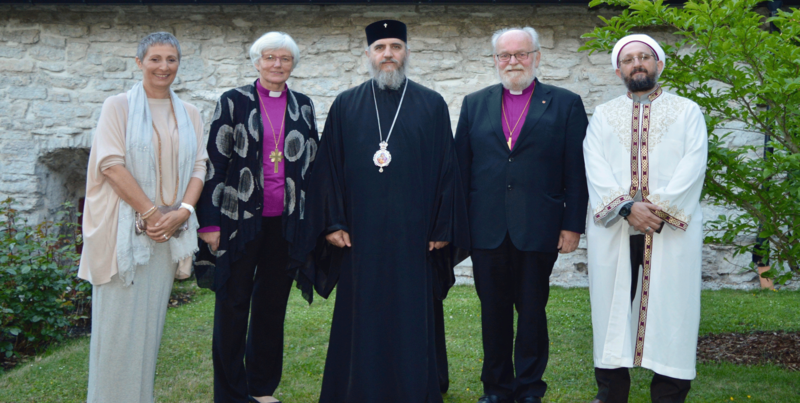 “The work of the religious leaders in Cyprus offers us a sign of hope”, said Bishop Fast. “While the Conference on Cyprus is underway in Crans Montana, we are happy to give space to a united voice from Cyprus reiterating their support to dialogue, cooperation and coexistence”, said Peter Weiderud, one of the architects of the RTCYPP. 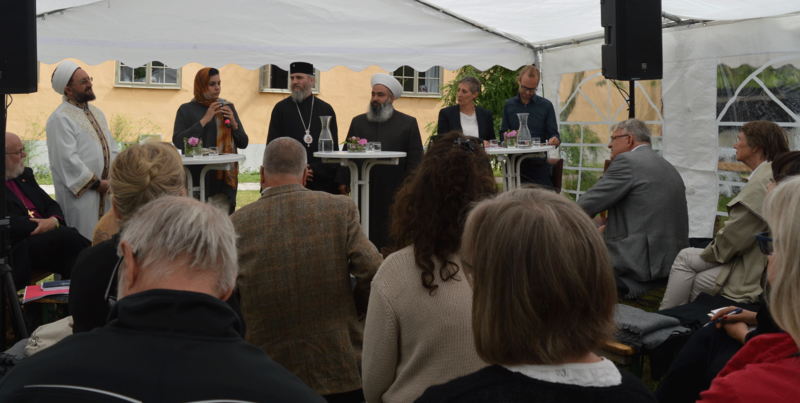 The delegation from Cyprus were invited to attend the formal reception of the Archbishop of the Church of Sweden, Antje Jackelén and Bishop Fast where they publicly thanked them and the Government of Sweden for standing up for human rights, international law and their contribution to peace and reconciliation in Cyprus. 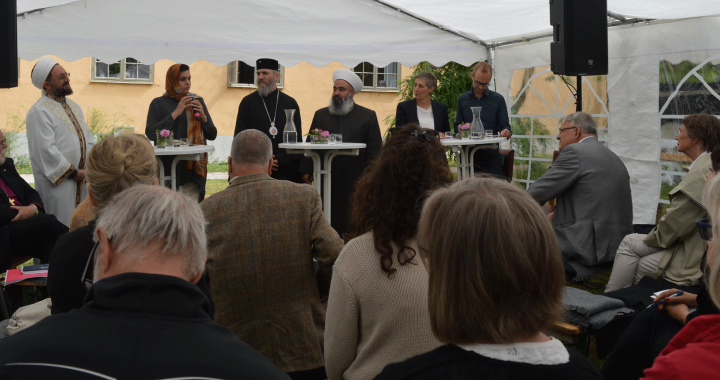 Representatives from the Religious Track of the Cyprus Peace Process (RTCYPP) are currently in Gotland, Sweden to be part of a seminar on 4th of July on the role of religion in conflict and peacebuilding at “Almedalen Week 2017”. Bishop Porfyrios of Neapolis, head of the Representation of the Church of Cyprus to the European Union, Imam Shakir Alemdar of Hala Sultan Tekke, representative of the Mufti of Cyprus and Salpy Eskidjian one of the architects of the RTCYPP will elaborate on the joint efforts of the Christian and Muslim religious leaders of Cyprus for human rights, peace and reconciliation. They will be joined by Dr Zahra Langhi, co-founder of the Libyan Women’s Platform for Peace (LWPP) and Judge Mohammad Abou Zaid, President of Saida Islamic Sunni Court of the Lebanese Republic to explore how religious leaders from different faith backgrounds working together can prevent or resolve violent conflicts, promote the respect of human rights and contribute to peace building. Professor of peace and conflict studies Dr Isak Svensson from Uppsala University will be moderating the debate that will take place at the Bishop’s official residence in Visby from 10:00 – 11:30. The seminar is co-hosted by the Bishop of Visby Sven Bernard Fast and Mr Peter Weiderud, director of the Swedish Institute Alexandria. Further information and photos can be found on Office of RTCYPP’s Facebook and by following #CyprusinAlmedalen #rtcypp. Almedalen Week is Sweden’s largest and most significant political meeting space in Sweden, taking place annually in Visby on the island Gotland for almost fifty years. It all began in 1968 when former education minister Olof Palme spoke from the back of a lorry at Kruttornet by Almedalen in Visby. Through democracy and openness, the week gives everyone who wants to debate social and political issues the opportunity to participate. The transparency and accessibility of Almedalen Week are unique for Sweden and the rest of the world. All events during the week are free and open to the public. The government of Sweden, all political parties, civil society organisations, the media, international partner organisations participate. The parliamentary parties, via their local representatives in Gotland, are the main organisers of Almedalen. The Municipality of Gotland is the host. The events during Almedalen Week are conducted in Visby city centre. Organisers rent venues all around the centre and invite participants to attend. For approval, the events are required to meet certain criteria such as raising a current social or political issue and offering the opportunity for dialogue. In 2016, 1756 different organisations held 3796 events around current social issues in one week. The number of contributors was 7540 people, 48 per cent of these were women.